People in the online space are sometimes surprised to hear that I’ve only ever been to one creative conference. There’s a million great ones out there, and lots that I would love to attend (Or even speak at? Oh geez, did I just type that? ), but I’ve actually only attended one single conference, and it was a pivotal one. I attended the Society for Creative Founders Conference in July of 2015. At the time it was still called Stationery Academy, and I even got to be their designer when they went through their rebrand and new name, SCF, after I attended the conference. My business (and life in general, hello!) has grown + shifted a lot in the last couple years, and a big turning point for me was when I attended this creative conference. SCF taught me the basics of running a thriving creative business and connected me with countless other creative women who were in the same boat as me – learning the ropes of this whole business thing, and looking for some friends to figure it out with. Many of these women are still my dear friends, and the people I turn to when I need some extra heads for brainstorming or feedback. I’ve never met anyone who regretted going to a creative conference, that’s how great they can be for online businesses. We sit at home by ourselves, usually, and run our made-up businesses. It can feel silly sometimes, we can feel like a fraud, and imposter syndrome creeps in more often than I’d like to admit. So when you find yourself in a room full of fellow business owners who feel the exact same way, it’s empowering and encouraging and makes you proud to be part of such a creative community. In today’s post, let’s dive into 3 lessons I’ve learned since attending that first creative conference, and how it shifted my business for the better. Again, when you work alone at home, it doesn’t take long for the cabin fever to kick in. As humans we obviously crave connection, so I’ve learned how vital it is as solo-business owners to connect with others like us (even if they’re halfway around the world). 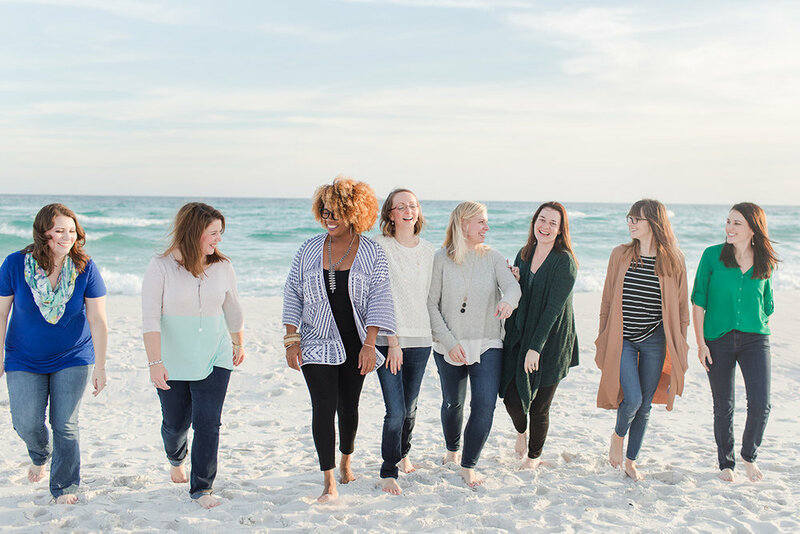 Attending SCF in 2015 solidified this need, and I formed a mastermind group with 3 other women at the conference that year, and the four of us continue to stay connected on a regular basis – in business and in our personal lives. I’m also in a mastermind with two other designers (you can read about how we plan our mastermind retreats here), and even those relationships are growing stronger the more we meet up in person or via Skype. Aside from the friendships made at a conference life SCF, I also made some pivotal connections that helped move my business forward. Like I mentioned earlier, the connection I made with the then-leader of SCF led to her hiring me for their huge rebranding project. Connections I made with other speakers that year led to more freelance + collaboration opportunities. These are all women I still keep up with today, and our continued support for one another makes such a huge impact on my business. Lastly, SCF recently went through another transition with a new owner, my dear friend Kristin Wilson now at the helm. She put together an alumni mastermind retreat that I’m so glad I signed up for, and 8 of us met up just last week in Florida to spend a weekend diving deep into each other’s businesses and accomplishing some serious goals. These ladies have become their own little community within a community, and I can’t wait to see how each of our businesses grow in the next year. We all invested in each other during that weekend, and our support will continue long after we all flew home. A huge takeaway that all 8 of us had at that retreat was something we didn’t even realize we were looking for until we got there — we needed permission to take big steps in our businesses. Some of us needed permission to let go of something, others needed permission to start something new. But we all were feeling the imposter syndrome, and we came together for a weekend to say over and over, Yes, you can do that! Seems simple, but we all agreed over a toast on our last night, that the permission of our peers to go and do big things was the push we needed to finally make it happen. If you’re anything like me, you probably often lose sight of the goals you’re working towards, because you’re knee-deep in the day-to-day operations of your business. Taking time away to refocus, getting out of your routine, and escaping your usual space is the perfect way to recalibrate. Getting an outsider’s perspective is vital to making sure your business decisions are actually lining up with what you want it all to look like in the next few months or even years. Long-term goals that I wrote down in my notebook at my first SCF conference back in 2015, are the exact goals I came to the alumni retreat to work on last week… cough cough… writing that book. There’s power in writing down your goals, and there’s even more power in sharing those with a group of people that you know will hold you accountable. This might be an odd one, but this was a big one for me. When you roll up to any creative conference or retreat, don’t assume you know it all. It can be easy to put up a wall out of nervousness or anxiety, but just be yourself and be open-minded to how the event will unfold. Yes, some content might be repetitive to you, but that doesn’t mean you can’t learn new things by hearing it from a different perspective. You can always learn something new. You can always take away a nugget of advice that maybe the speaker wasn’t even intending. Come into it open-minded, and look for inspiration and ideas in every corner of the event – the speakers, the other attendees, even your conversations over breakfast. Keep your eyes open. To wrap this up, I have to plug my girl Kristin and her vision for Society for Creative Founders in the coming years – big things are on the horizon for SCF, and I’d love to see some familiar faces in that community who are ready for the ride! Their next conference is April 15-18, 2018 in beautiful Pensacola, Florida, and you can read all about it (+ register!) right here. No affiliate or kickbacks or anything, just a community and a conference that I genuinely love, and I know it's equipped to help you take big steps with your creative business. but the deadline to apply is Tuesday, January 30, so hurry! Details are here. And if SCF doesn’t seem like the right fit or timing, find a conference or even plan your own retreat with some business besties where you can get out of your little bubble and meet other creatives face to face. Seriously, it's a game changer. Have you been to a creative conference that helped shape your business into what it is today? What did you learn from it, and how do you continue to build relationships within their communities?